Virtual reality has been talked about for years, but it’s finally here—and accessible for anyone with a smartphone. The VR KiX headset lets you access the many virtual reality games and apps on Google's rapidly growing public platform, Cardboard. Place your phone inside the virtual reality goggles and it turns the screen into an immersive, 360-degree experience. Move your head to explore the amazing new surroundings—fight off alien invaders, watch a concert like you’re there, or take a tour of a foreign land. To create 3D environments, VR KiX uses a technique called stereoscopy that shows an offset image to each eye. Your brain combines those images, which gives a realistic impression of dimension and depth. 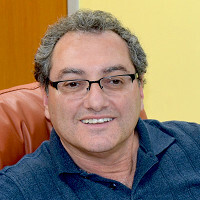 Founder Joe Elichaa wanted to create a headset that was better than the competition. He added vents to help keep your phone cool and a secure tray to hold it. Then, to keep you comfortable, he included padded face cushions and an adjustable design. The future is now, and VR KiX is an incredible and enjoyable way to see it. Hello everyone! I'm proud to introduce VR Kix to The Grommet. I'd be happy to answer any questions you have! Serious question, how do you get any work done with this lying around your office? Do you take gaming breaks throughout the day? Mike, I wish I could spend my time playing! I have been so busy trying to bring this to market, I have not had much time to play lately but I do use it to explore and test new apps and content managers. I remember the sense of wonder the first time I experienced a virtual reality video and it keeps me motivated to introduce this experience to others. What was the toughest part about bringing VR Kix to life? The toughest part was ensuring that I got the things done for the product that I felt would be important to a consumer…. I am still working on some ideas that can make it easier for customers to learn how to get involved in VR and have an enjoyable experience. It needs to be easy…to understand and to use. You are launching during virtual reality’s infancy, what do you foresee the impact of this industry being in a few years? In designing this, what were some elements you felt the product needed to have? It needed to be light weigh, comfortable and keep the smartphone secure. I wanted it to have lenses that would adjust to any user’s eye width. That was important because it helps to eliminate motion sickness while using it. I felt it also needed a face pad that is easy to keep clean and sanitized. Because otherwise…yuck.. no sharing allowed! To be launched on The Grommet means that someone else sees the value and possibilities of our product. 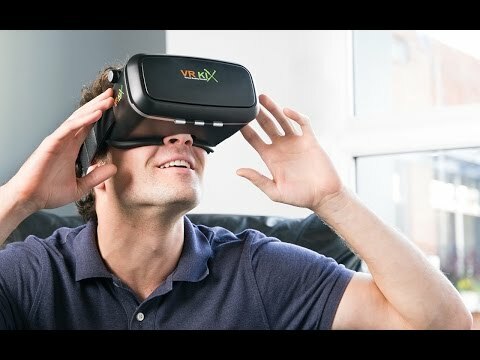 I hope the community embraces the VR KiX as a way to start navigating and experiencing what virtual reality has to offer today and in the future. Because this technology is so new I think most of the feedback from The Grommet community will be questions about what they can do with the product. Will this work with IPhone 6 plus ? @Tuck Hi! Yes it will...but you must remove it from it's case. @Joe What case do you remove? Hi Eric, the case on your phone if you have one. If not, nothing to worry about! How would this work if one needs glasses? Looks great. Will this work with all/most/some? smartphones? I have an iPhone 5c. @Kevin I have an iPhone 4 w/iOS7. Will it work with my phone? Hi Mary Margaret, yes it will! Game on! Is the VR Kix appropriate for children? For what ages? @Anne It can be used for children because the lens adjustments will bring the lens in to fit a smaller face with a smaller distance between the pupils. I would not recommend use of any VR Headset for children under 6. Will the VR Kix work with iPods? If yes, what versions of iPod? @Anne Hi Anne, I know that it will work on the 5th generation iPod Touch, I will check if there are any others and answer with an update. @Joe The 4th generation iPod Touch has an accelerometer so it should work with our VR Headset. This looks amazing! Can you tell me how the sound would work? Would you simply use your regular ear buds from the phone? @Tracy Hi Tracy,You can use your regular earbuds. Just plug them into the phone's jack and bring the out through the side vent. I have been using it without any headphones because the apps all play just fine using your phone's speaker. Just turn your volume up or down to suit your environment. will this work with iPhone 6s Plus? and when you use this device and the phone Ring can i answer it w/ out interrupting my viewing? @Rene It will work with the iPhone 6s Plus but you need to remove it from your case if you have one. This will depend on your phone settings and the player you are using. You could but your phone in DND. Will the device work with the Motorola Droid Turbo? @Harold According to your specs which is (144 X 74 mm) it will fit our holder. Your size is also 5.2" device. Does this work with any Samsung phones? @JOe Yes, it will work on Samsung, I have used and tested it on S6 Edge, S4, Note4 and will work on the Note5. You may need to remove the case on the Note4. How can you play games while wearing it- is the a controller that comes along with it, or is there one that you purchase to use it while playing games on your phone? Hi there! You use the motion of your head and your eyes to do the controlling. For instance, in one game I played (the one I referenced in the video) you use eye contact to shoot targets and your head to adjust the aim. It really makes for a fun, new way of gameplay. @Guest Hi thanks for asking! Many game apps are starting to use eye controls meaning that you focus your eyes on a target, or other on-screen controls to advance, shoot or make selections. There are also games compatible with existing controllers like PS3 and PS4 and other Bluetooth controllers. Perhaps you could ask The Grommet to stock Bluetooth controllers for this unit. Does this work with any size smartphone including iPhone? @Jason It will handle up to a iPhone 6 Plus, it will work with Android OS and IOS. I have a iPhone 6 and an employee has a 6 Plus. @Jason Hi Jason. It will work with any iPhone....up to 6 Plus..and any other smartphone up to 5.9 inches. The larger phones will need to be removed from their cases in order to fit into the device tray. How do you control a game? Are there buttons on the sides of the viewer? @Tim Sorry about that last question. Your prior response answered my question. @Tim Hey, No Problem! Thanks for your interest in my product. I'm happy to answer any question! Would like to know if there are alot of games I can get for this at this point and how do you control them with out a joystick? @Alesia Hi Alesia. Visit your app store and type VR Game on the search window. This is the fastest way to see what is available now. Many new ones show up every week. You can use your eyes to control many games or you can use a bluetooth controller from your PS3 or PS4...or any brand or bluetooth controller. @Alesia Ok I did see one of the previous comments that answered my question about the controller just wanting to know about games available. I want to get this for my son in law a big gamer. @Alesia Hi Alesia, There are plenty of games, some use a controller and other just use your eyes to focus on target. Check the Apple app store or the Google play store. What about the software? What is currently available? Is there an "ap store"? @Joe Hi! What is the difference between Virtual Reality and Augmented Reality? What is the weight of the unit, before the phone has been included? Have any beta testers had trouble with the weight of the unit over extended playtime? How do you power the unit? @Roxanne Hi Roxanne! Augmented Reality superimposes images from the app into your everyday world. 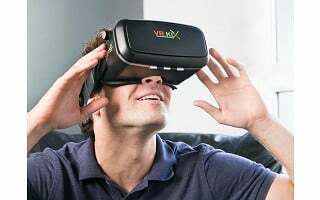 It uses your phone's back camera to let you see through the viewer into where ever you are...and adds other images like dinosaurs or spaceships...VRKiX has a removable front panel that allows you to have access to your camera for AR. The VRKix Weighs just 13 ounces without a phone.We have had no problems with head or neck strain because the headstrap helps distribute the weight evenly over your head. As long as your phone is charged you are good to go! Can you watch any movie or you tube video for example or only the App based content or can you view content such as movies through the App? @Robert Hi Robert, Thanks for Asking! You can watch video from any source like YouTube or Discover VR as long as it is in SBS (side-by-side) format. For YouTube you can type sbs video into the search window for available videos. @Joe Hi Joe whats the price and when will it be available ? Do you recommend any particular video converter software to convert 2D movies to 3D SBS? @Robert Hi Robert, I have not used any software for conversion at this time. I will download a version and post the answer after I test it. Please give me a day. @Robert Sounds good... I look forward to hearing about what you find out... Have you thought about having a version of this headset that is Bluetooth compatible so that you could view from any device? @Robert Hi Robert there is way to stream your content from a PC / Mac to your mobile device via wifi or even direct connect. @Joe Yes I can do that. I was referring to maybe a built in screen with Bluetooth on the headset itself. Hi Robert, it is certainly a possibility for the future! As far as a 2D to 3D converter, Joe said he had some success with the below link. You don't have the ability to look around and there was a small feeling of depth. @Rick Hi Rick, our holder will be able to hold your LG G2. I have been looking closely at ALL the different VR headsets on the market for the last month, as this technology fascinates me. And just today I got an email from my NY Times newspaper subscription that they have sent me a free cardboard viewer to go with their new focus on publishing VR content. So, yeah, I see this technology completely taking off. Even though I currently have a free cardboard viewer on the way I am still in the market for something that is more durable, comfortable, stable and adjustable, while also being affordable. And I believe that it is no coincidence that I see your Grommet launch today. This product looks exactly what I am wanting and have been looking for. Thank you and good luck. @Robert Hi Robert, Thanks for your good wishes and I hope you stay involved with VR as if grows and matures. Will different pupil to pupil user differences work with the same center to center source distance from the phone. I cannot conjugate the two views with Cardboard. @Jim Hi Jim...We have an IPD (inter pupilary distance) control to center the pupils and another adjustment to move the phone screen (source distance) to help focus and center the VR media. Absolutely amazing job! I'm getting one for my son for Xmas right now! Look forward to seeing how your great design works. I've not experienced VR headsets yet. @Gus Tahnks Gus! Enjoy...make sure you get you son to let you try it! Will it work on an galaxy s5? @Andrew Hi Andrew, Yes it will! Am I correct that this is not a powered device but a housing for a lens configuration that adjusts the image from the phone into a vr experience. Sort of like the passive 3-D glasses for TV's. @Wayne Hi Wayne, VRKiX is not a self contained unit. It does require a smart phone as the computer and appropriate APPs from your app store to deliver a VR experience with limits to motion and immersion based on those apps. @Wayne Hi Wayne, You are correct it is not a powered device but depends on your mobile device. There app and content that you can interact with because of the sensors and power of your phone. You get a 360 view of your content. Great questions from everyone, keep them coming we love solving problems. It's been awesome working with The Grommet. And it's been awesome working with you as well, Joe! You are crushing it right now! @Mike Big smiles and thumbs up!! Will this work with Samsung S5? @Debby Absolutely!!! and with the high resolution screen it will be amazing! @Debby Hi Debby, yes it will work with the S5 and you will love the experience. Thank you for your question. Will it work with an IPod6? Hey Joe, I have a Samsung Galaxy Note3, will it work on this device? @Cindy Hi Cindy, I will fit but without any case on your device. I hope this helps and have fun. @Joe Sorry Cindy, It will fit our VRKiX headset without a phone case on your device. what is the cost of the games that work with VRKIX? are they all available on apple web site? @Susie Hi Susie, Some games in the app store are free and some cost just a few dollars. @John Hi John, The sound plays through your phone speaker. You can also plug in headphones and enjoy in private! Just bring the cord out through one of the side vent panels. What if you receive a phone call? You'll have to take it out of the VR Kix to answer or put your phone on DND, Lester! How do I found apps for iPhone that will work with VR Kix? Check out the Apple store, Donald! You can find a whole host of them there! product only work only with already 3D programs and apps? Thanks. @Ed: what enhancements will watching a 3D movie like "Avatar" get by using this product? I want to understand better how the 360 degress view works? Hi Ed, thanks for the questions. You won't really see any enhancements in 3D viewing. It will be closer to your face so it might be a more intense experience, but that's about the extent of it. There are a number of events that are filmed with a 360 degree camera. The SNL 40 special comes to mind immediately. With that you can turn your head and see different angles. So you can be looking at the stage, turn your head and look into the crowd, or look behind you at the camera guy. It gives you the feel of being in the venue. That's what the 360 degree viewing experience is. How does this VR headset compare the the other headsets that are coming out on the market, (i.g. Oculus Rift, PlayStation VR, Gear VR, HTC Vive) to name a few? Also do you know of a website that we could look at the see what movies, games etc. that would work with your VR? HI Kris, Our headset VRKiX differs in the "operating system." Unlike Oculus Rift, it is not hardwired to a PC, or connected to a game station. It does not come with a preloaded 'theater' that stores your content. It uses apps available from your app store paired with your smart phone, not limited to a Samsung S6. You can create your own "theater" using the Google Cardboard app. This works for Android phones only. Apple users can access the downloaded app just like other apps. You can go to your app store and type VR into the search window to see what is available to download. YouTube has a 360 app there as well fro available videos. Virtual reality has been talked about for years, but it’s finally here—and accessible for anyone with a smartphone. The VR KiX headset lets you access the many virtual reality games and apps on Google's rapidly growing public platform, Cardboard. Place your phone inside the virtual reality goggles and it turns the screen into an immersive, 360-degree experience. Move your head to explore the amazing new surroundings—fight off alien invaders, watch a concert like you’re there, or take a tour of a foreign land. 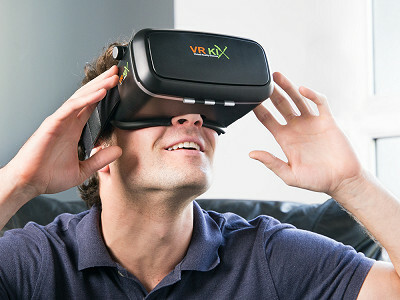 To create 3D environments, VR KiX uses a technique called stereoscopy that shows an offset image to each eye. Your brain combines those images, which gives a realistic impression of dimension and depth. Founder Joe Elichaa wanted to create a headset that was better than the competition. He added vents to help keep your phone cool and a secure tray to hold it. Then, to keep you comfortable, he included padded face cushions and an adjustable design.